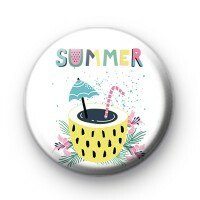 This cute 1 inch badge has all the Summer vibes - cute pineapple cocktail and the font is so bold and bright too. It would be the perfect addition to any holiday pack pack or denim jacket. It will help you get channel your Summer Holiday Vibes.